Cove v Brora on Saturday as well. I’d say a Cove victory would end a title race. Aye, Brora did look decent at though. Fingers crossed for them. The rest of the juniors are supposed to be joining the pyramid from next season. The west structure fits neatly into the existing setup but the issue is with the remaining east juniors and how they fit in. Some of the remaining east juniors should feed into the Highland league going by the dividing line. There are threads on it in the junior and EOS forums but majority is the usual junior vs senior nonsense. I heard a bit of chatter yesterday that a number of the smaller ex-Junior sides in the east are heading back to the Juniors. Top of table clash in Highland League ended in scoreless draw between Cove & Brora. Both still equal on points but Cove have two games in hand. In Lowland League East Kilbride won 2-1 against Civil Service Strollers. Still 10 ahead of BSC who've played one game more & 11 ahead of Kelty who have played same number of games as EK. EK in a good position. Only 7 games left. They only need 11 points from 21, less if the other challengers drop points. They should be able to rest players if necessary and be fresh for the play offs. Cove still have 11 league games to play. Now, Kelty can finish with a maximum of 66 points, therefore EK only need 8 points to win it. TBH I think that's the only interesting battle left. Who gets second spot? Hoping EK keep the momentum going as I suspect your right Kel. It's going to be done and dusted before you play them. 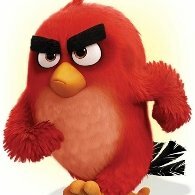 With games running out we're going to need someone (probably EK) to do us a favour. No matter what happens it should be an interesting run in. 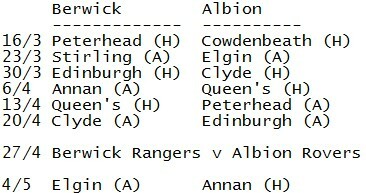 Looks like a marginally easier run-in for Albion Rovers there, but plenty of difficult games either way. Massive game for them coming up this weekend. Suspect there will be a massive s***storm at the end of the season if Albion Rovers finish ahead of Berwick by less than three points. Fair chance of getting shot of the English team now. Some result for Albion today. Top of the table clash in the Highland League saw Brora & Cove draw 1-1. Cove still 3 ahead with a game in hand. In the Lowland League EK failed to win today drawing 0-0 with Cumbernauld Colts so the title party has been put on halt, EK's next chance to wrap it up is at home against Spartans on Tuesday. Genuinely hope Albion Rovers keep this up and overtake Berwick - albeit we've inadvertently helped them to this point! Berwick won't be missed if they go. And I would imagine they wouldnt be back any time soon! There'll be no more help next Saturday when Clyde wallop them. I'd prefer AR to retain their league status rather than BR or any more interlopers with their two men and a dog level of support but business has to be done on 30/3. Not sure if you are looking for a bite but I’ll have a nibble anyway. Our average attendance is almost double that of Albion’s this season and our average att. is around 450/500 isn’t so bad considering our season and our form over the past few years in fact. Wednesday: Fort William v. Cove Rangers. So long as the game gets played you can already call Cove 6 points clear.